3 GPP Release 12 was largely completed on-time in March 2015, with a few exceptional features allowed an extension to later in the year. Release 12 builds on the innovations in Release 10 and Release 11 to further increase performance, efficiency and capabilities. All three releases are known as LTE-Advanced. 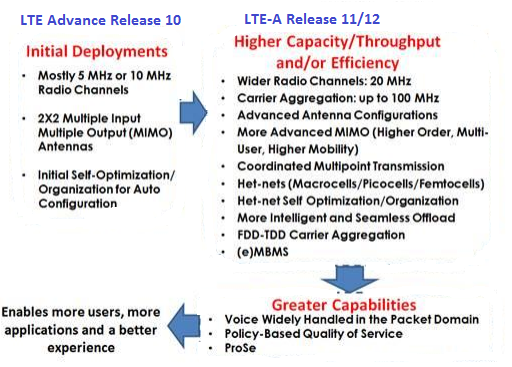 Figure show evolution of LTE Advance. A priority in this release was to use LTE technology for emergency and security services, with technical specifications for mission-critical application. Mission-Critical Press-to-Talk (MC-PTT) and other features, scheduled in Release 13. Release 12 features two Channel State Information (CSI) enhancements: 4 Transmit Precoding Matrix Index (PMI) feedback codebook enhancement and aperiodic CSI feedback with PUSCH mode 3-2. The CSI enhancements enable the Evolved NodeB (eNB) to complete delivery of data packets earlier than with legacy CSI feedback, thus improving spectral efficiency. Release 12 4Tx codebook enhancement mainly targets cross-polarized antennas and thus, reuse of the 8Tx dual codebook structure. In addition to the enhanced codebook, a new aperiodic CSI feedback PUSCH mode 3-2 increase CSI accuracy since it provides both sub-band Channel Quality Indication (CQI) and sub-band PMI feedbacks. 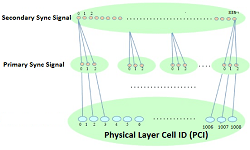 Mechanisms for efficient operation of the small cell layer are introduced in Release 12 include interference mitigation through optimally powering On/Off the small cells, cell discovery signals and procedures, and Radio Based Synchronization based on Network Listening. For spectral efficiency improvements in Release 12, the highest supported modulation was increased from 64 QAM to 256 QAM for both PDSCH and PMCH. Separately, a Higher Layer study focused on mobility robustness, reducing the signaling load toward the core network due to handover, and improved per-user throughput and system capacity using dual connectivity. Dual connectivity refers to situations where a UE is capable of using radio resources provided by at least two different network points: a Master eNodeB and one Secondary eNodeB connected with non-ideal backhaul. Related to small enhancements, Release 12 also has several femtocell enhancements, including mobility to shared Home eNodeB and LTE X2 Interface. The mobility to a target HeNB that is shared by multiple operators relies on the principle that the Public Land Mobile Network (PLMN) which is going to be used at the target side is selected by the source Homr eNB. The challenge is that the target PLMN selected must be compatible with the UE in terms of membership when that Home eNB is hybrid/closed. Release 12 enhances UE mobility procedures by adding the capability to read and report to the source eNB (prior to the handover decision) a list of acceptable PLMNs of the target cell. When receiving this new list and deciding to trigger the handover, the source eNB is also enhanced with the capability of verifying that it actually is an equivalent PLMN or the serving PLMN. Increased data traffic leads to network densification which can include deploying multiple small cells, particularly numerous HeNBs, under each macro sector. This architecture creates a number of challenges for the scalability of X2 connections. Rel-12 enables scalability by letting an eNB connect to its neighbor Home eNBs through one or more LTE X2 Gateways (X2GW). The feature remains backward-compatible in the sense that the peering connections can be either direct X2 or via the X2GW. 3GPP Release 12 enhances LTE-Advanced ability to support MTC/M2M applications. One work item focused on low cost and extended coverage. On low cost enhancements, a new UE category with reduced data rate, half duplex support and single receive antenna was introduced. Another work item evaluated RAN solutions involving UE Power Consumptions Optimizations (MTCeUEPCOP) and Small Data and Device Triggering Enhancements (MTCe-SDDTE). A new power saving (or dormant) state was introduced as part of the UEPCOP work, while Core Network assistance information for eNodeB parameters tuning was introduced as part of SDDTE. In ProSe communications, UEs that are near each other communicate directly rather than via the cellular network. The ProSe service in 3GPP is split into direct discovery and direct communication. Release 12 focuses on enabling direct broadcast communication between public safety personnel when a network is unavailable, such as fa disaster situation. The ProSe discovery process identifies UEs that are near each other and enables operators to provide a highly power-efficient, privacy-sensitive, spectrally efficient and scalable proximate-discovery platform. It can either be direct, or at the Evolved Packet Core (EPC)-level and is authorized by the operator. The network controls the use of resources used for discovery. Signal timing, discovery signal design, payload definition, resource allocation and resource selection were all studied as part of discovery design. Cell densification, HetNets and the various MIMO types, all make UE receiver enhancements an ideal way to mitigate the increased inter-cell interference that comes as a natural consequence. Rel-10 was the first to define advanced UE receivers with interference cancellation and/or suppression. Rel-12 now includes a new category of UE receivers called Network Assisted Interference Cancellation and Suppression (NAICS) receivers. The basic principle behind the NAICS receiver is the exchange of semistatic cell configuration information between the neighboring eNBs through X2 backhaul interface and higher layer signaling from serving eNB to UE of the neighboring cell configuration parameters. 3GPP Release 12 SONs focused on the interoperability aspects of existing features along with introducing new features. This work includes evaluating different opportunities with more UE-specific handling, in light of release dependent requirements linked to the UE’s capability to be served by a cell that is not the strongest cell (cell range extension). One example is the ping-pong handovers in the case of different treatment of various UE types and capabilities in two eNodeBs involved in load balancing. Another aspect concerns network deployments based on active antennas and the new needs for SON to manage the deployment, as well as the impact on existing SON features. Heterogeneous Networks (HetNets) can be deployed in single carrier or multicarrier environments (including non-CA and CA cases). Seamless and robust mobility of users from LTE macro to small cell layer, and vice versa, is needed to enable benefits of offloading. UE mobility-state estimation is based on the number of experienced cell changes in a given time period, but without explicitly taking the cell-size into account, and hence the mobility-state estimation may not be as accurate as in the macro-only environment. The Mobility Enhancements Work Item provides means to improve overall handover performance with regard to HO failure rate and ping-pong in HetNet environments. Optimal configuration of parameters and better speed estimation are seen as potential solutions. It is also possible to configure different Time-totrigger values for macro and small cell target cells. Faster re-establishments after a HO failure in HetNet where another suitable cell is available, are introduced to reduce interruption time for the user and improve the user experience. Operators must have tools and processes for maintaining service when a node or interface fails. In Release 12, MBMS enhancements extend these recovery schemes to cover all MBMS nodes and interfaces. The first cornerstone of MBMS recovery mechanisms consists of re-establishing the MBMS sessions over the M3 interface following a Multi-Cell/Multicast Coordination Entity (MCE) failure or an M3 path failure. The feature can also re-establish MBMS sessions over the M2 interface following an eNB failure or an M2 path failure. The second cornerstone consists of the Mobility Management Entity (MME) takeover following a Spatial Multiplexing (SM) path failure. For example, when there is a permanent SM path failure, this feature enables the MBMS gateway to select an alternate MME from the pool. Although support of MBMS services has been introduced in Release 9, there have been no UE measurements defined that could be reported to the network in order to help monitor the signal quality at the UE. In order to provide better tools for the network to monitor and adjust the MBMS operational parameters, new measurements targeting MBMS Single Frequency Network (SFN) signals are introduced in Release 12. 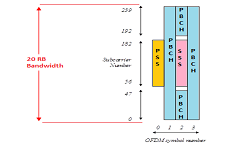 Examples of radio layer Multicast Broadcast Single Frequency Networks (MBSFN) metric can include measurements related to signal strength, signal-to-noise ratio and error rate. It has been decided that the handling of group communications service enablement for public safety would rely on MBMS services offered by LTE in Release 12. Typically MBMS bearers would be established in advance and would experience low activity most of time until a public safety incident occurs in a cell (car accident, fire, etc.) in which case several tens of public safety groups could suddenly need to communicate in that cell concurrently over those MBMS resources. One issue is that MBMS radio resources are allocated semi-statically in a cell and would typically be set according to the large low activity period in order to not over provision them uselessly. But then when an incident occurs, the allocated MBMS resources would experience severe overload. The Release 12 work item on Group Calls MBMS Congestion provides mechanisms to cope with this overload situation. It includes the feature “Collocated SIPTO at local network.” This feature enables offloading of Internet traffic from the RAN node through an embedded PGW function and into the private network. It also extends to a variety of RAN nodes, ranging from eNodeB to Home eNB and NodeB+ to HNB. By directly offloading the Internet traffic into the private network, this feature significantly alleviates the core network’s workload, particularly for stationary or nomadic UEs. The “SIPTO at Local Network with Stand-alone GTW” feature leverages the Release 10 feature “SIPTO above RAN.” However, the Release 12 feature has two main differences regarding location of the PGW enabling the offloading (in the private network) and the collocation of the Stand-alone and PGW. The set of RAN nodes served by a same gateway thus make up what is called a Local Home Network. 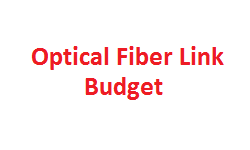 This feature allows operators to offer a seamless offloading function for UEs moving within an Local Home Network, while avoiding the single point of failure connectivity issue. LTE supports two different duplex modes: FDD and TDD. To better utilize spectrum in a TDD system, a TDD configuration that matches the traffic could be selected. This is the scope of the eIMTA work. Most networks see more downlink than uplink traffic and hence utilize a somewhat downlink heavy configuration. This is typically configured to be the same over the whole network to make sure as to not introduce strong base station-to-base station interference. This implicitly means that the TDD configuration seldom matches the instantaneous need of a cell, only a long term average of the network. To enable better utilization of TDD resources, dynamic adaptation of uplink-downlink ratios is introduced in LTE Release 12 to enable traffic adaptation, a UE is configured with two different TDD configurations from the network. The UE then follows one configuration for uplink communication and a second configuration for downlink configuration. 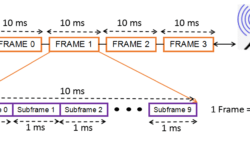 The subframes with different directions in the two configurations are dynamically selected by the network for either uplink or downlink communication. To save UE power and enhance channel quality measurements in the UE, the base station provides an indication of what subframes will be used for uplink and downlink respectively using a new physical layer signaling. The indication is communicated in a broadcast manner. Within Release 12, 3GPP has specified support for allowing UEs to operate TDD and FDD spectrum jointly. The main solution to be specified is CA between a number of TDD and FDD carriers. CA between the FDD and TDD spectrum would allow user throughputs to be boosted (at least for DL CA) and it would allow a better way to divide the load in the network between TDD and FDD spectrum. In addition to CA support operation of dual connectivity between TDD and FDD is further specified. Dual connectivity1 provides a tool to connect UEs to cells that are operating either TDD or FDD while the cells are connected with a backhaul of higher delay than that required for CA. The reason for operating in such a mode can, for example, be to enhance user throughputs, lower core network signaling or enhance the mobility performance.